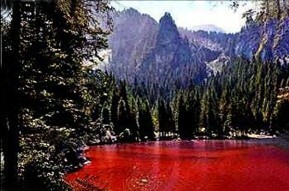 At one time Lake Tovel in the summer was taking a red colorasione; here is the scientific explanation. Tovel Lake is an alpine lake and it’s under the municipality of Tuenno (TN). It is situated in the Northern part of the Brenta Dolomites at a hight of 1178 and it represents one of the most beautiful attraction of the Adamello Brenta Natural Park. During the last century, this lake became very famous at an international level, because of the red colour of its waters. People could see this phenomenon during the hottest hours of the day in Summertime. The folks, as usually happens for every strange fact, tried to give an explanation of this event by a mythological and fairy-tale point of view. So, it was born the charming legend of Queen Trèsenga; this legend reflected the disputes, historically documented, between the population of Tuenno, Val di Non and Ràgoli, which fought to obtain the predominance of the mountain area of Brenta. So, all the strongest and most corageous young people were sent to the capitals of the neighbouuring kingdoms as ambassadors, to communicate that Trèsenga would give up get married. Therefore, all young princes and knights had to stop going to Ràgoli full of gifts to propose to the young and beautiful Queen. So, all the suitors decided unwillingly to renounce and to turn their sights somewhere else. Only Lavinto, King of Tuenno, against the ambassadors and their edicts, decided to go to Ràgoli with lots of ladies and knights. In reality, Lavinto had no interest in Trèsenga: he only wanted to obtain that little kingdom, which was full of pastures and forests, and because of that reason lot of people desidered it. He thought that this kingdom would have turned Tuenno to an invincible power. Trèsenga was impassive and refused Lavinto. Then, Lavinto left Ràgoli, but he camped in the outskirts and in the following days presented bouquets of wild flowers, with rings made of gold or silver in the stalks to the Queen. He also tried to convince the recalcitrant Queen with long and passionate letters and with romances written by his ministrel for the occasion. Then the doubt started to creep into good Trèsenga’s mind. - My loyal people of Ràgoli - confided the Queen at the assembly of the patriarchs –you know how insistently Lavinto is aking my hand. If it had been for me, I wouldn’t have given it to him, even for a mountain of gold; but I would like you to be ruled by a strong and powerful King... Tell me again : what do you prefer, a Trèsenga mother or a Queen? Even that time no one have a doubt : Trèsenga as Queen! And so, the day after the camp, at dawn, the King of Tuenno awoke because of the noise of the inhabitants of Ràgoli, who went in the camp armed with swords, pitchforks and sticks; so Lavinto had to recognize his defeat-the first one of his life-and had to go back to Tuenno. The beautiful, strong and resolute Queen Trèsenga went with her loyal citizens Brenta’s mountains, in order to put an and to the disputes for the boundaries of Tuenno. Her porpuose was to rule the mountains, that surrounded Tovel’s valley, that was full of grazing lands. Trèsenga and her followers reached Castellazzo, that dominated the valley from Nana Plain, where they established their headquarter. Then the troups went down to camp in Flavona Camp and in Malga Tuenna, in order to push their opponents to the other side of the lake by a strong action. Trèsenga’s and her captains’ plan was very easy : all the people must go down from Castellazzo and Flavona to the basin of the lake, to launchtheir final attack. 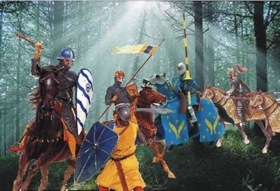 So they did, but they didn’t take care about the guile of the soldiers of Tuenno, who had a perfect knowledge of the wood of tovel and so they had arranged small patrols, with lots of sentinels all around the area. When Trèsenga’s troops, composed by the cavalry, the infantry, and the banners, reached the shores of the lake, also their enemies arrived behind them, hemmed them in a sort of ring. So a furious battle began.The soldiers of Ràgoli last Only Trèsenga and a little number of soldiers managed to escape to the valley ; but they didn’t know there was an enemy patrol behind the bar of the lake. For the proud Queen and her soldiers, there was no escape; but also their enemies had a lot of losses. Lot of blood was shed for that battle and from that day the waters of the lake became red and in memory of the valiant Queen , the feeder of the lake got the name Trèsenga. Today Tovel lake had lost its “red magic”, but in the nights of full moon, people can still hear a lament of woman on the Western shore: she is the poor Trèsenga, who is crying for the death of her loyal soldiers and friends. This legend is taken from : the spectacle of nature and the signs of men written by Sandro Zanghellinin People can buy this book at the Visitors Center of the Adamello-Brenta Natural Park. The dell of Tovel Lake was of about 12,000 years ago. It developed during the final stages of the last glaciation, while it reached the actual aspect several centuris ago; nowadays it is 1 Km long, 570 m wide and with a maximum depht of 39 m. Tovel lake is known worldwide for the red colour of its waters, due to a particular alga called “Glenodium Sanguineum“ (also called crowned Woloszynskya) The Glenodinium sanguineum in an unicellular alga (dinoflagellates)that contains oily substances coloured by carotenoids pigments in the plasma. The dinoflagellates, traditionally known as pirrofite or pyrrophyta, are microscopic aquatic algae that contain type A and C- clorophyll, carotene and specific xanthophills that contribute to the formation of the placton both in the see and in the lake. They are mainly unicellular and movable and they have a high level of self-organization. They have got two ciliate flagella ; one of them is situated in a groove that surrounds the cell. These carotenoid pigments gave a unique characteristic to Lago Rosso in the Tovel’s Valley, that in certain period (Summertime)had a red colour. This phenomenon , that last until the ‘60s, now has disappeared. The microrganism hasn’t disappeared from the lake: it is still present, but it can not proliferate as before.